The pulse beats may be counted by this unusual method. On a clear day, when the sun is shining brightly, darken a room and select one window toward the sunlight, which should be prepared as follows: Draw the curtain sand has been emptied, the cardboard should be removed from the box and each blossom taken from its pin. In the case of succulent specimens, the stems will have shrunk considerably, but the thinner petals will be in an almost natural condition. The colors will be bright and attractive. Some tints will have kept better than others, but most of the results will be surprisingly good. Whatever state the flowers are in when they are taken from the box, if the drying process has been thorough, they will keep almost indefinitely. Flowers preserved in this manner are admirable for the decoration of homes. If they are exposed to light, care should be taken to see that the direct sunshine does not strike them, as it will fade the colors. Sprigs with leaves attached may be dried in this way, but it has been found that much of the intensity of the green is lost in the process. part way down and cover the rest of the window with a heavy cardboard. Cut a small hole in the cardboard to admit a beam of light. Set a bowl of water on a table in the path of the beam so as to deflect it to the ceiling as shown by the dotted lines in the sketch. It is now a simple matter to show the pulse beats. 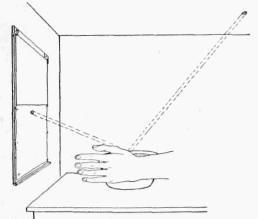 Place the wrist against the edge of the bowl as shown, and the beam of light directed to the ceiling will record every beat of the pulse by short, abrupt movements.